Pacific Rim has a limited number of the 2oz White Whale Privateer Rounds available and when they are gone, they are gone. These white whale silver rounds are pure .999 fine silver, the finest silver coins ever minted and distributed in the U.S.A. Each coin contains two troy ounces of pure silver. 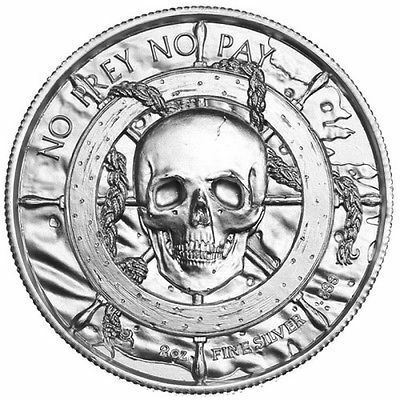 The White Whale Privateer silver rounds are impressively large and substantial collectors coins. Reverse: Displays a traditional pirate ship fighting the mighty sea through a stormy sky, with a whale thrashing around in the rough waters which has been struck by 3 harpoons.